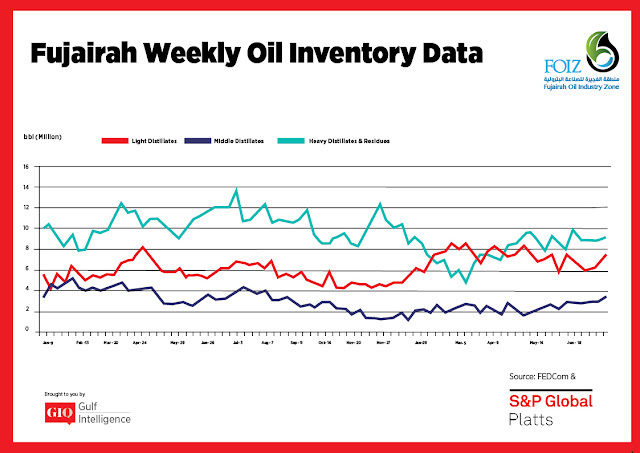 Oil product stocks at the Middle East's key oil hub of Fujairah jumped nearly 10% in the week to Monday, reaching their highest level in seven months with builds across all product categories. Total oil stocks were 20.146 million barrels, up 1.8 million barrels from a week earlier, according to the Fujairah Energy Data Committee. The biggest increase was in light distillates, with stocks rising 17.6% to 7.862 million barrels, a 10-week high. Market fundamentals remained soft in the Asian region but stronger in the in the Middle East, sources said. "The [Persian Gulf] gasoline shortage is starting to become a structural short. We are competing with US buyers for Mediterranean barrels and for Indian barrels we need to compete with Singapore," one trader said. Spot premiums for Arab Gulf RON 95 gasoline remained at a near six-month high at $3.85/b Tuesday. Middle distillate stocks also rose by 15.4% week on week to 3.333 million barrels -- a nine-month high and the first time stocks topped 3 million barrels since September 11, 2017, S&P Global Platts Analytics said in a report Wednesday. 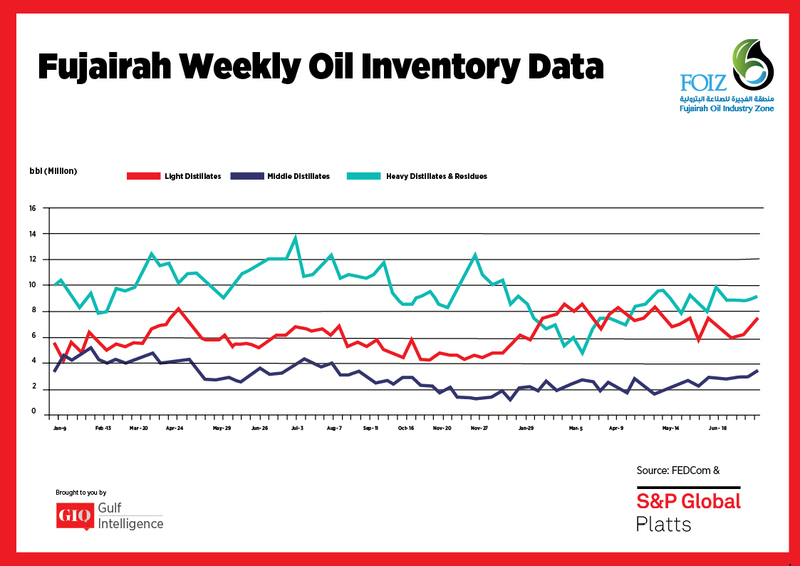 The East of Suez gasoil market was seen as weak, with the market structure flipping into contango against a backdrop of mounting supply, according to Platts Analytics. Higher run rates at regional refineries have also boosted exports from India, Northeast Asia, and the Middle East, the report said. The front-month East-West Exchange of Futures for Swaps had widened to around minus $10/mt in recent days, which should offer some relief by pushing additional cargoes from the Persian Gulf and West India to Europe, Platts Analytics said. Stocks of heavy distillates and residues inched up 2.4% week on week to 9.131 million barrels. This is despite a steep backwardation in the front-month time-spread for Arab Gulf 180 CST swaps, which was pegged at $5.25/mt Tuesday, the report said. Fundamentally, there is continued power generation demand in the Middle East and steady bunker demand in Fujairah, it added. 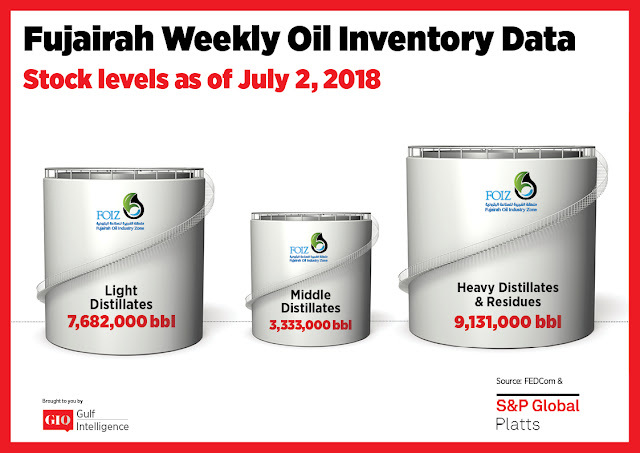 "Demand is decent but fixing levels are not too good due to competitive selling...Some sellers may be holding on to old cargoes with cheaper prices," a Fujairah bunker fuel trader said.